To help me in the creation of my media product I decided to look at how another artist has constructed her image. I have chosen to look at Kate Nash because her music is in a similar genre to Kate Nash and the same target audience. Kate Nash has a very hand made aesthetic to her image, with her some of her album artwork comprising of drawn images and handwritten style fonts. Both Ellie and Nash play guitar and therefore the musicality of the artist should be an important part of both their images. I personally enjoy they way Kate Nash uses old styles with a modern twist. One way she does this through clothes. She often wears vintage styles with more modern and brighter colours. When filming our video I want to use possibly a floral style dress with a some sort of fur shrug possibly to give a more sophisticated feel. This contrast will be popular with her audience as it is very fashionable at the moment and her target audience would be very into fashion and keeping up with trends. Her style is really rough-chic. 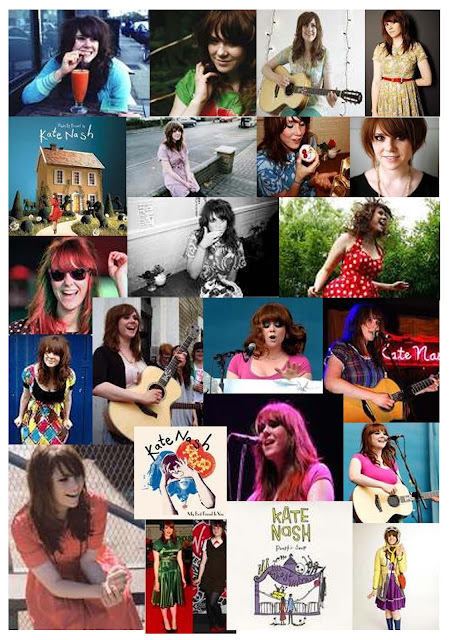 Kate Nash has really inspired me for all of my media products and I think her brand model is something that I can use to model my construction of Elli's Image around.